I’m super impressed with the methods and efforts Mike Caulfield is doing for the FedWikiHappening – a bunch of folks are trying to hang onto the flying lines of understanding of the Smallest Federated Wiki. What he is taking us through feels much more effective that all of his demos, blog posts, and workshops combined. Learning be doing. I’m only incrementally getting a better understanding. The idea of using FedWiki as a gathering of notes, then going IdeaMining is shaping. But it runs against most of our intuition. I got lost last night, because I thought I could fork it back and edit, but every attempt gave me the dreaded OHoD (Orange Halo of Death), meaning my changes never left my computer. I was a bit frustrated, and for some reason I glanced at the bottom and noticed that I was not logged into my own wiki (I thought I used the option to remember my login for 30 days, buts that with Persona, not FedWiki). A bit of the terminology I find confusing is the multiple meaning (and use of the button) of forking. To be, and in my quasi experience of using versioning systems currently github), and in Wikipedia – forking refers to the splitting out of code (or anything) to a new copy to be changed. So, yes, it makes sense to fork a copy of someone else’s FedWiki page to my own local copy, where I can change it. And the federation works, people can see (if they can parse the little chicklet patterns) or check Recent Changes to see its evolution. But forking, to me is always the branching out, new copies. Only with many more twists. So we end up joining our own spawned chain of changes. So it’s a familiar challenge of wikis in that there is a perceived sense of “ownership” of that note, so people do not want to trample it, so they attach it to the bottom, like blog comments. It’s not a problem. I can go in and do some massive re-arranging and absorb it into a more whole of an article (if it merited the effort). If I get the way Mike envisions it, rather than attaching commentary, people would start recasting it in their own context. What do you say Mike? Is this the way your students approach it first? Of course, I have yet to start my own forking of other people’s stuff. Hey Alan… some good #fedwikihappening energy is moving around just now! I just left a hangout organised by Ward http://forage.ward.fed.wiki.org/view/office-hours after having a short conversation with Ward, Paul and Mike. My asked a couple of questions about forking… similar to what you’re wondering about here. Earlier this afternoon I commented on a page *and then* forked it, but I think forking first and then commenting/changing is probably better practice? And as for the “Added Commentary” convention you noted here in your post — I see what you mean. But I think it depends on the nature of the post. In our hangout just now, Ward actually edited someone’s page (which asked a number of #FedWiki questions) so that he could fork out to answer just one of those questions. He was editing to enable more granularity, it seemed to me. See my own confusion? How do you comment on a page w/o forking?? Oi my head hurts. p.s. 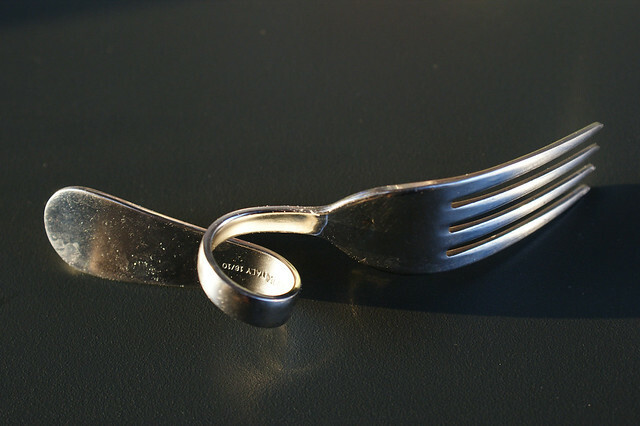 you have found the best CC fork photos! I think the challenge here is that we are being good academics. We want to be able to keep track of who added what so contributions can be properly credited. Paragraph level histories could solve this, Maybe you could access via a drop down. Also, we’re using SFW in a way that is more group oriented than the original design. As fellow travelers through the happening, we want to be able to add a meta-layer, to talk about the work we’re creating. MediaWiki does this with talk: pages, but SFW presumes a set of individuals working side by side rather than collaborating explicitly. Mike has posted on this somewhere. 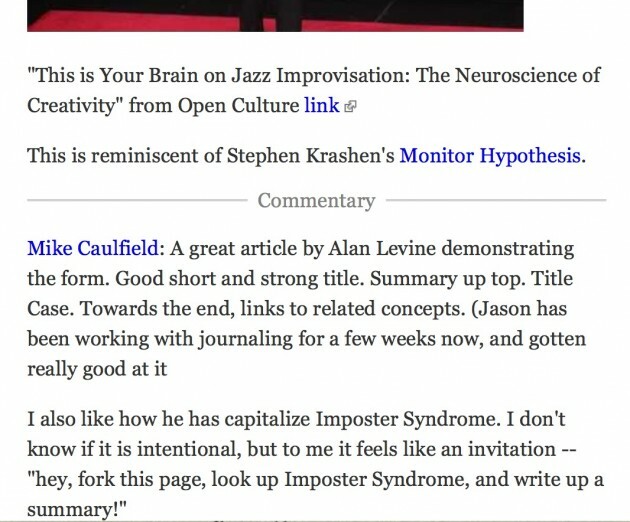 The “comments” with links back to the author are how we are cobbling together a meta-layer. Comments are a double-edged sword. Every page should move from towards not having comments. But I found with my students that they are so timid that commenting has to be the gateway drug. So it’s no different than running an online political community — you turn readers into commenters and commenters into editors/authors. But sometimes people need the step, or need an explanation of what you changed. Ideally, comments always suggest a way in which the document could be improved or extended, so as you address those comments in the document, you delete the comment, like you might do with revision suggestions. Deleteing a comment in this case is actually a compliment — it means you considered someone’s idea and either did or didn’t do something with it. But if you are one of the ones compfortable with just editing — please, be that person!!!! We need more! Hi Alan and Maha… curiouser and curiouser :) A problem may have been in my language above. It seems it may just be a semantic difference between (i) commenting/changing someone else’s page and then saving (forking); or (ii) forking first, then adding the comments/edits. The result seems to be the same! In any case, the track changes feature shows it all, in sequence, so you can always see who did what by looking at the icons at the bottom of the page. I’m now good with that. I’ve just re-watched Mike’s video “Federated Wiki: Information Lifecycle” https://www.youtube.com/watch?v=2Gi9SRsRrE4 and it makes a LOT more sense now after playing around in the wiki for the past day or so. It actually answers lots of the questions we three have been tweeting & blogging about… how to find out when your page is edited; editing information within a page (rather than appending comments); etc. Thanks, once again, to Mike for all this scaffolding. Yes, that is helpful, I’ve seen it before and it’s helpful in the conceptual understanding (this too the pitfall of content in video, there’s not way to search and find it, so we rely on fellow travelers). The thing is, when we say “we added a reply” e.g. when George adds something to Arthur’s article, we are not adding it to Arthurs. I *think* as soon as you click to edit, you have forked a copy– you can only edit things in your space. So commenting is no different from forking an editing. All changes are in your (forked) copy and they are federated out as a new color chicklet version. But here is where Mike talks too fast http://youtu.be/2Gi9SRsRrE4?t=6m20s he says “If Arthur accepts these updates” but does not explain what he is doing by accepting- he is merely clicking the fork button on George’s wiki to fork it back to his own site. Wow, so I’ve been watching all of you tweet and write about forking, and I’m still right there with y’all. Mike spent a generous amount of time teaching me yesterday. Embarrassingly, I wasted a ton of his time on my clapped out state issued equipment (sigh). What really helped me was watching him fork slowly. We read together, and I observed what he does, and I’m really excited to try it today. I am here and this is what I’m thinking right now.” The second action that we are calling the comment is more like “the curate” (sounds like a toothpaste brand, so I’m not married to it). It’s what you bump into when you return to your flag. And finally, “the forking” says either “yes, and” or “yes, but” (like improv) or the “not forking” says, “very well, carry on good chaps, but that’s not my direction today. Cheerio.” Does that make sense? Thanks for the think through. I feel like its a tad less cloudy though i an far from understanding it. Theres a bit of that McLuhan-esque thing whete in this new medua we first try to do what we did in another. It is hard to get over this feeling of being out of sync with versions. The other bit Ward highlighted us that if you dont like the way it has moved, you can step back in the edit history (all icons at bottom) and fork back the preferred version. But this appears to others like a new verdion rather than stepping back in time. What does this mean for people with the versions agter your fork back point? Ouch my head hurts! A Visit to The "X"